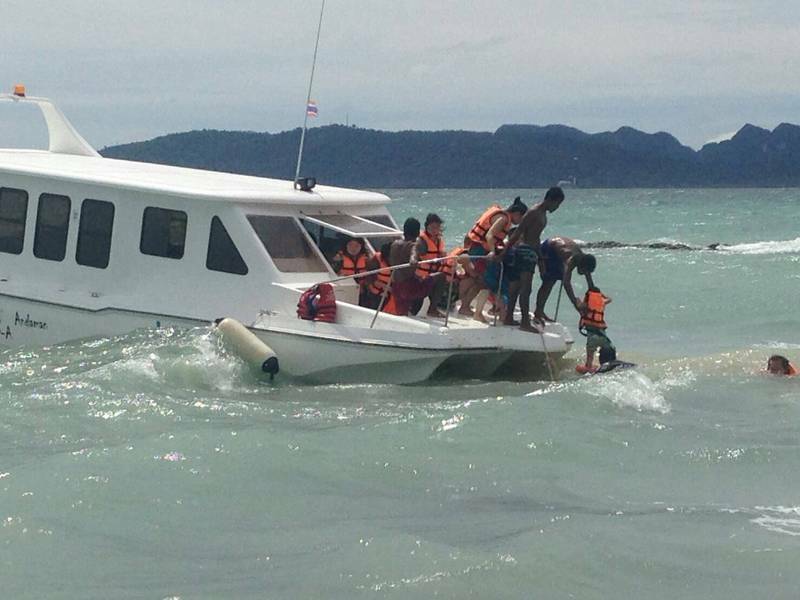 PHUKET: National park officers have safely recovered 22 Chinese tourists stranded on Koh Mai Pai (Bamboo Island), northeast of Phi Phi Island, after their tour boat sank in rough seas east of Phuket earlier today (Jan 4). Chaiyan Chaikam, Chief of the Hat Noppharat Thara – Mu Koh Phi Phi National Park, was alerted to the tourists' situation at 11:40am. “We were informed that the boat Giant 121 had been hit by strong waves and was taking on water,” Chief Chaiyan said. “We dispatched a National Park rescue team to bring them safely on shore, which took about 30 mins. The boat later sank and we have marked the vessel with red flags,” he said. 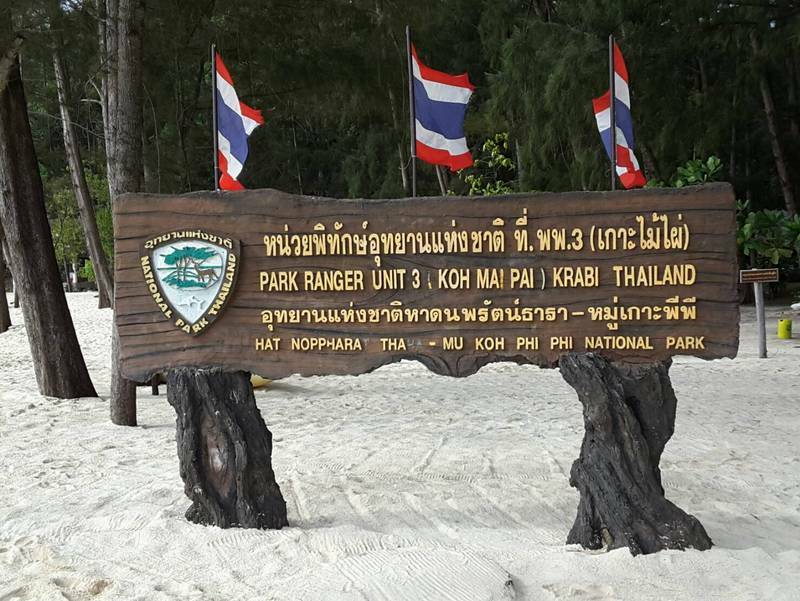 Komkrit Arundet, 30, captain of the Giant 121 , told park officers that the tour itinerary was to take the Chinese tourists from Phuket to Koh Mai Pai, then on to Phi Phi Island for lunch. However, the boat starting taking on water after it was hit broadside by a large wave, he said. 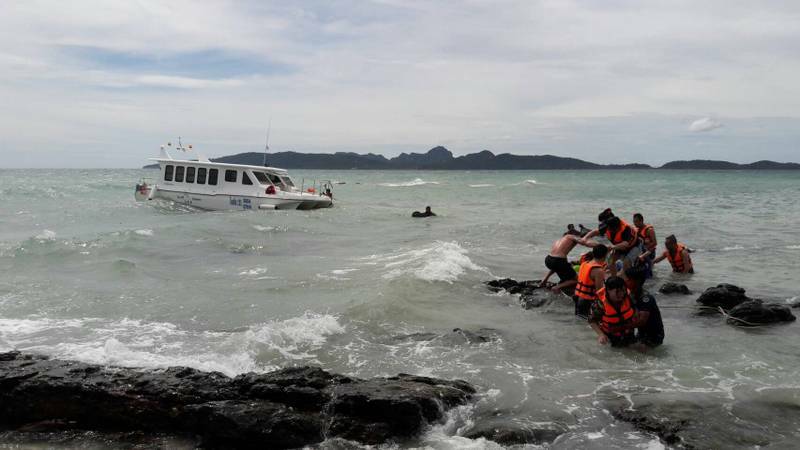 Soon after, at 12:10pm, the park officers received another distress call, this time from a longtail boat operator whose boat was pushed by strong waves onto rocks, which punched a hole in the hull, at Koh Moh. The engine stopped immediately and seawater flooded the boat, reported one park officer. “The longtail driver reported six foreign tourists were floating in the sea,” he said. 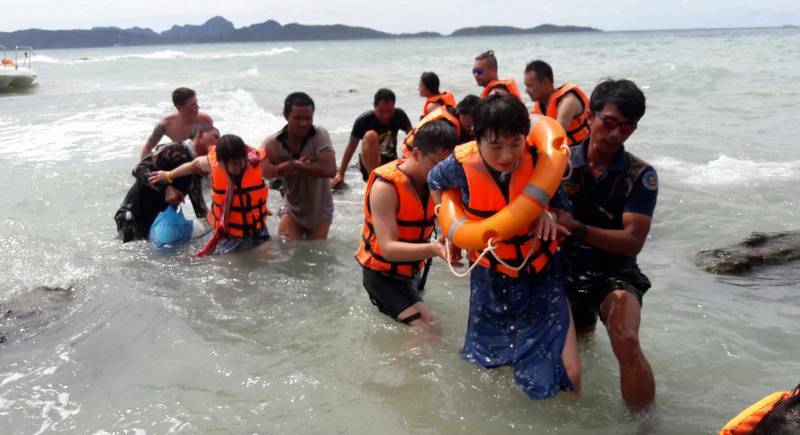 Park officers stationed at the tourist-popular Thale Waek isthmus, which joins Koh Dam Hok and Koh Dam Kwan took a longtail boat to rescue the stricken tour party. “They were all taken to Koh Gai (Chicken Island). 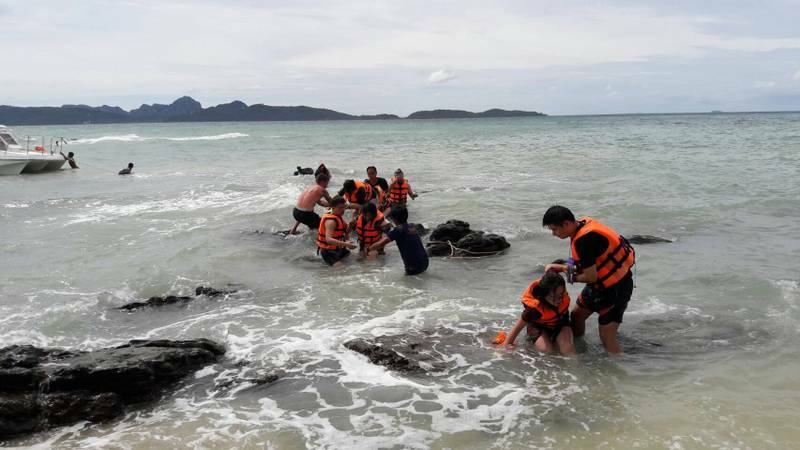 They were now all safe,” the park officer told The Phuket News. The Thai Meteorological Dept earlier today issued a weather warning for “Heavy to Very Heavy Rain in Lower South” and “Strong Wind Waves” in the Gulf of Thailand. “The strong northeast monsoon prevails over the Gulf of Thailand and the South, the low pressure cell covers Sumatra and Andaman Sea. Severe rains are forecast for some of following provinces: Chumphon, Surat Thani, Nakhon Si Thammarat, Phatthalung, Songkhla, Pattani, Yala, Narathiwat, Ranong, Phang Nga, Phuket, Krabi and Trang. “People should beware of the severe weather conditions and possible flash flood,” said the warning. Weather warnings issued, but, as usual, they set sail. What ever happened to them being checked, stopped, by the Marine authorities, oh wait, I guess we know.